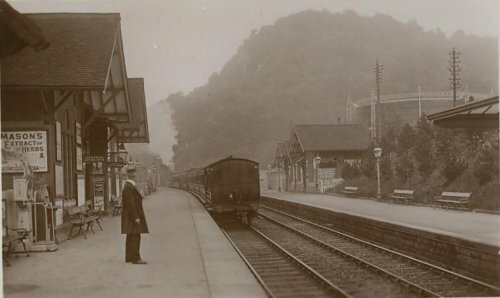 The tinted postcard, taken before 1905, shows a Midland Express passing through Matlock Bath station, heading towards Derby. In the background is High Tor, to the right the Gasholder. The line disappears into a tunnel to get through a spur of High Tor. To the left is the River Derwent and the delightful small town of Matlock Bath. 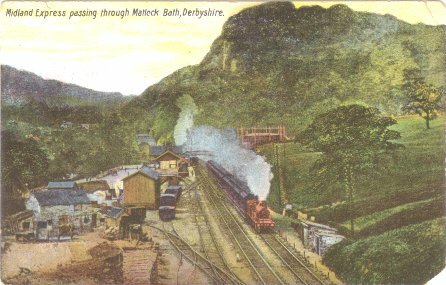 A train leaving for Matlock, with High Tor in the background and the the local gasholder on the right. Both platforms have gas lighting. The photo was probably taken about 1925. Under the advert for Mason's Extract of Herbs is a rather delightful personal weighing machine, the kind that took an old penny, the pointer swung round and stopped with a dramatic "clunk", attracting the scornful view of strangers! See Photo 221 as the station looked in 1862.